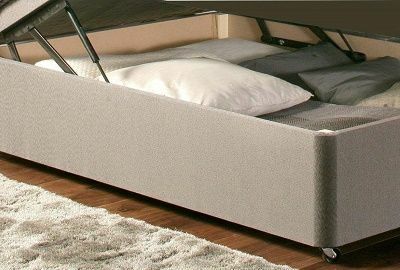 The Respa 4' Ottoman Divan Base is a bottom opening ottoman base providing optimum strength and support to your mattress. With a wide range of upholstery finishes available, the Respa Single Ottoman Base provides more storage than a base with drawers. The Respa 4' Ottoman Divan Base provides Excellent Support for all Types of Mattresses, including heavy pocket spring mattresses. This Bottom-opening Ottoman Base offers ample storage for storing bed linen and clothes when not in use. Available in a Wide Selection of Upholstery Finishes, this ottoman base provides remarkable strength and stability to your mattress. The Respa Ottoman Base benefits from Free Delivery and Free Collection and Recycling of Your Old Bed throughout Northern Ireland, and Counties Monaghan, Louth and Dublin, in the Republic of Ireland. What's more, we’ll also Unpack and Set-up your New Ottoman Base in a Room of Choice and Dispose of all the Packaging.